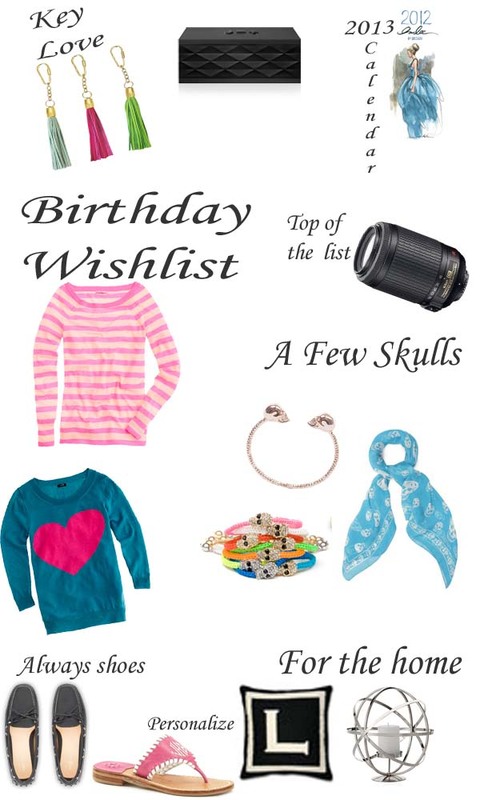 My birthday is in two weeks and I created a wish list of items I am currently crushing. I am not expecting to receive all of these but it would be super nice if I did! I picked some of my favorite items that I love. Blair Ritchey key chains are so colorful and girly. The Jawbone jambox is for wireless portable tunes. Our neighbor has one and it is so cool to just sync up wireless from any device that is bluetooth. The Inslee calendar has not been released yet but I am patiently waiting. The Lens is top of the list! The J Crew sweaters appear so soft and I love the stripes. Skulls and more skulls. I am crushing big time over the Alexander McQueen rose cuff and the scarf is awesome. The cranium bracelets I already own in blue but feel like a pink and white need to be added to the party. I would live all fall and winter in a good driver and Car Shoes has a wonderful shoe, the only problem is they don't ship to the US! I think you deserve all of these! I really want to get the JA pillows for my couch but I'm trying to decide how narcissistic is too narcissistic...lol. I am dying for a new camera lens! def High up on my birthday list as well as a Blair ritchey tassel! Hope you get some of these wishes for your birthday!